Jeffrey Van Middlebrook, a polymath inventor in Silicon Valley, in 2006 figured out a way to sequester gas from waste combustion that, if brought to an industrial scale, could be worth a fortune. Middlebrook invented the system in his workshop, and called it the broad-spectrum fractional sequestration combustion gas liquefier. After making it work on a small scale, he went shopping for funding domestically. Neither the government nor private enterprise was willing to offer the kind of money needed to bring the invention from the workshop to an industrial scale. Then in 2011, China came knocking. On two occasions Middlebrook met with Communist Party delegations: from Hubei Province in San Jose in 2011, and Jiangsu in San Francisco, February 2012. Affiliated with a university in China and backed by the Communist Party’s deep coffers, they offered him and a business partner $60 million in research and development funding. He would have had a laboratory at a university in China, with the scientists, engineers, and equipment needed to bring the invention to an industrial scale. It was early 2012, and negotiations began smoothly. By May 2012 Middlebrook’s Chinese partner, an MIT-educated scientist who led the negotiations with the Chinese delegations, was arranging for them to travel over in September. The Chinese were deeply interested in Middlebrook’s invention because of its potential application in advancing clean coal technology. China is the world’s largest consumer of coal, and the pollution resulting from burning it to generate electricity is enormous. Around half a million people in China die prematurely each year from air pollution-related illnesses, and the burning of coal contributes significantly to the black smog that chokes China’s cities. Then Middlebrook began reading news in The Epoch Times that Chinese military hospitals have harvested the organs from tens of thousands of prisoners of conscience, predominantly practitioners of Falun Gong, a peaceful spiritual discipline. He read about mindbending torture and unyielding state-led persecution. And he balked. Middlebrook, formally trained in geology and engineering, has invented a multitude of devices, some of which are currently being exploited commercially. His gas sequestration system uses a series of chambers, each of which pulls out some undesirable compound from waste gas, turning it into liquid. It can trap carbon dioxide, sulfur dioxide, and hydrogen sulfide, for example; once in liquid form they can then be neutralized and used for agricultural or industrial applications—rather than released into the atmosphere. Middlebrook’s other inventions include a chainsaw safety shield, a 360-degree toroidal camera, a remote control fit-all retrofit anti-carjack system, and a horizontal sewer release valve, which he invented in 1991 and is currently in contract negotiations over. 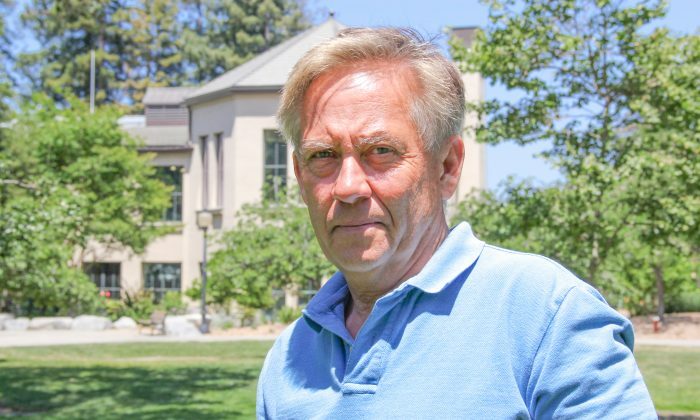 He runs the company Invention Dynamics, LLC, and has been a face around northern California for decades. A Monterey County Weekly article notes that in the late 1970s he did the “carpentry, plumbing and electrical work” for the Pacific Grove home office of Gary Kildall, one of the pioneers of personal computing. About six months after he informed his colleague that he was exiting the deal, Middlebrook wrote a letter to The Epoch Times to thank the newspaper for its “journalistic honesty, at least as honest as any human beings are capable of reporting anything.” The Epoch Times then contacted him and began to verify his story. Middlebrook provided a detailed description of his invention, and allowed an editor to review two related patent applications. He provided a photograph of part of the device, as well as a letter from Leon E. Panetta, the former secretary of defense, acknowledging Middlebrook’s CO2 sequester invention. Panetta wrote: “Your best resource is probably government funding of some sort, however. I must warn you that funds for these types of projects are scarce given the current state of the economy.” That was in December 2008. Documentation of Middlebrook’s negotiations with the Chinese delegation resides with his former Chinese partner, who led the negotiations, and whose name Middlebrook required be kept confidential. “I don’t want anybody to get hurt,” he said, a reference to the fact that Chinese security forces, and the Communist Party, are known to severely punish people who speak out about the regime’s human rights abuses. By being associated with Middlebrook, his former partner, who is ethnically Chinese, grew up in China, and continues to visit family and do business there, could become a target of punishment and have his business interests or safety threatened. The partner holds a range of inventions that aim to recycle water from industrial waste using microorganisms, and which were originally planned to be developed commercially with Middlebrook’s sequestration chambers. The Epoch Times independently verified the partner’s identity. The Epoch Times contacted another associate of Middlebrook’s, Reinaldo Garcia, a playwright, musician, and former journalist, for a character reference. Garcia just finished writing a movie script based on an idea that Middlebrook had. He recalled seeing a post on Middlebrook’s Facebook wall months ago, announcing the fact that he had turned down R&D funding from China after reading about the regime’s organ harvesting from prisoners of conscience. In early 2006 The Epoch Times received a tip about a hospital in China’s northeastern Liaoning Province where Falun Gong practitioners were being killed for their organs.